I talked a long while back about the importance of finding ways beyond the scale to track your progress. 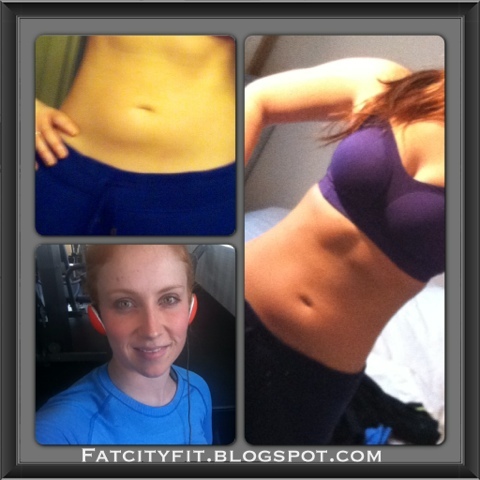 The scale can be very deceiving, especially if you're adding muscle mass (which I often am). Things like eating salty foods or having your period can send the scale skyrocketing as well and it can be really discouraging. Clothes sizes can be better but frankly with the vanity sizing going on these days and the huge variance in sizing between brands (and even within brands), it's very hard to judge from sizing alone. Measurements are great because they don't lie. But again, as you add muscle, you may get bigger in some areas, but overall look more toned and be happier with your appearance. The best way to truly see your success is to actually see it - progress pictures. I've been off and on about taking pictures of myself but recently I snapped a couple shots because my abs are finally starting to make an appearance! Now if that's not motivating, I don't know what would be! So even of you're not loving what you see now, take some photos so you can really see your success. You'll be glad you did. And nobody but you has to see them if you don't want to share. But I'll take the leap and include one here! Love it! Such a better way of judging. Each person carries their weight so differently and at the end of the day, you want to like what you see in the mirror. What you see on the scale is just a very small part of the equation!